Some aquarists are able to stick an aquatic plant in gravel, and it takes off. Others monitor the water, type of plant, feed it, and it dies. What works for one person, doesn’t necessarily work for another. Did you know? You can buy live plants, such as the baby tears pictured, on Amazon! The type of filtration in an aquarium can make a difference. Undergravel filters pull water through the gravel and inhibits plant growth by depriving them of nutrients. While this type of filtration isn’t as common as it once was, it is still used and isn’t recommend for a planted aquarium. Plants require minerals as a food source, and if these aren’t available in the water, they might not flourish. A common mineral to encourage plant growth is iron. If a plant has yellow leaves adding iron may help rejuvenate plant growth. Doing a complete water analysis may illuminate other deficiencies. However, there are several general purpose plant food formulas for the fish tank you can buy that encourages plant growth. Plants need carbon dioxide and some aquarists infuse carbon dioxide into their tank. An organic liquid additive like this one, that is poured into the tank will provide carbon dioxide. Gravel or sand is a common substrate aquarists use in the bottom of the tank. The optimum substrate size for plant growth is about an eighth to three-sixteenth of an inch. Another option is clay. Clay is an aquarium substrate often used in blackwater biotope tanks and makes a natural looking tank, and provides plant nutrients. These are materials prepared for aquarium use, and are popular for blackwater as well as clear water aquariums. They have nutrients necessary for plant growth. Use clay by itself, or put a clay sub layer under the gravel or mix it in with the gravel. Rinse the substrate before putting in a fish tank by putting it in a colander with fine holes, and run water through it until the water runs clear. Putting the substrate in a water bucket with a hose, and running water until the water runs clear also works. Rinsing these substrates can’t be overstated. The biggest user complaints are these products being dirty. One of the things to check with water is pH, general hardness (gH) and carbonate hardness (kH). pH and hardness are related as lower pH water is softer and higher pH is harder. Calcium and magnesium are common minerals that make water hard. Hard water generally contains less carbon dioxide than softer water. Most plants will do well in medium soft water. Extremes may cause a problem growing aquarium plants. The angelfish’s natural habitat has a pH of about 6.5 to 7 and most plants will grow in this range, but may need supplements. You will also need a source of UV light for your plants to grow tall and thick. These LED fish tank lights provided a needed source of UV light and allow you to adjust the lighting of your tank to mimic their natural habitat lighting. An excellent book on growing aquarium plants is Encyclopedia of Aquarium Plants by Peter Hiscock. 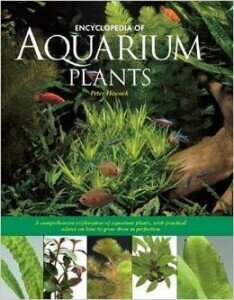 This book gives the needed information about planting and growing aquarium plants. It contains about 450 color photos and illustrations of plants and their care. 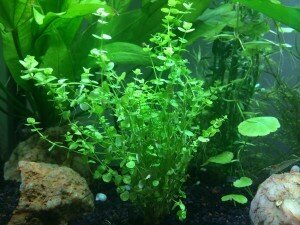 The plant information tells how hard they are to keep, and how to make them thrive in an aquarium. It’s a must for someone serious about growing plants in an aquarium. The Encyclopedia of Aquarium Plants is good for beginners as well as more advanced aquarists. This entry was posted in Angelfish Care and tagged Lighting for Planted Aquariums, live fish tank plants, live plants, Planted Aquariums. Bookmark the permalink.